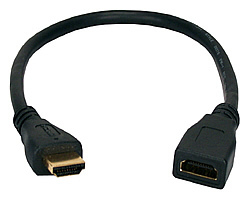 This premium HDMI certified cable supports HDCP,high-bandwidth,uncompressed video and multi-channel digital audio,has double shielding for maximum video performance,prevents signal loss & screen ghosting. It is RoHS Green Certified and production process that uses laser jacket stripping & aluminum foil cutting with precise machine soldering. cables have matched impedance,PVC jacket,molded ends and inner hood soldered 360 degrees to the connector for complete end to end shielding.